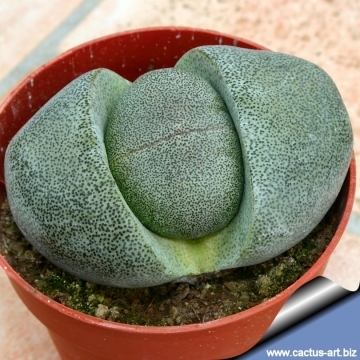 is the popular split rock plant, looking like a piece of greenish speckled rock, and with a perfectly straight cleft right down the middle. Just so everyone knows, these plants are suppose to have one or two pair of leaves. Each year the old pair is consumed by the new leaf pair. If you water during the regeneration, then the plant may keep the old pair. Warmth is also a factor for a complete cycle for the regeneration to occur at the proper time. 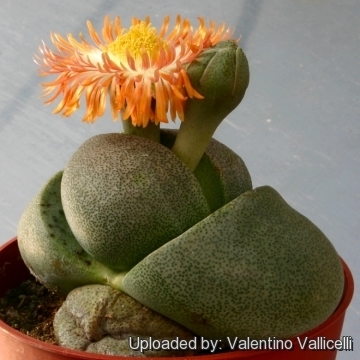 The cycle is just like Lithops. Habitat: Plants occur in shale or sandstone areas in areas where light is usually bright and unpolluted. The annual rainfall for the distribution area for these plants is between 150mm and 300mm. Habit: It is a stemless, perennial, leaf succulent. Mostly there will just be one head, but very old plants will form two and eventually more heads. Body: The body of the plant consists of 2 or 4 globe shaped leaves, fused at the base that naturally sit above the surface of the soil and can grow to about a height of 5–8 cm and about 10 cm across. The leaves have a deep fissure in the middle and are usually grey green to brownish in colour with many conspicuous raised dark dots scattered over the whole surface. 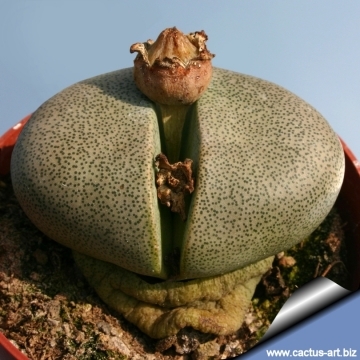 The plant produces a new pair of leaves from within the old one each year, much the same as Lithops and Conophytum do. Flowers: Large daisy-like, fragrant whit a distinct smell of coconut. Considering the size of the plant they are extremely large (up to 6-7,5 cm across), and have a great many petals and they are yellow to coppery-orange, seldom white or pinkish, in colour with a paler throat. They are solitary or in clusters borne on short pedicels. 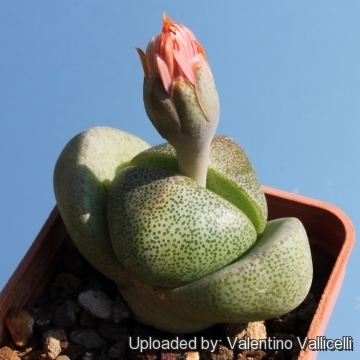 Blooming season: Usually flowers in early spring after the winter dormancy period, although some plants can flower in autumn like a Lithops, depending on how they are grown. The blooms open in mid-afternoon and close just after sunset. 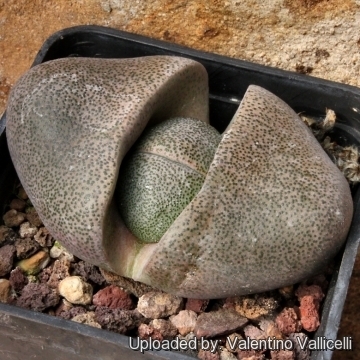 Remarks: Sometimes Pleiospilos will even be labelled as a Lithops, but it isn't the same. 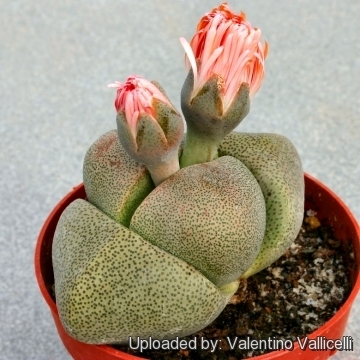 There are three immediate visual differences: P. nelii does not grow buried to its neck in the ground; it is bigger than any Lithops and will produce multiple flowers at once, something that Lithops never do. 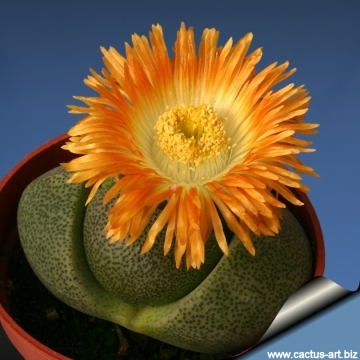 Pleiospilos nelii Schwantes: Small clump forming, stemless, nearly spherical succulent. he body of the plant consists of a pair of globe shaped leaves, fused at the base that naturally sit above the surface of the soil and can grow to about 10 cm across. 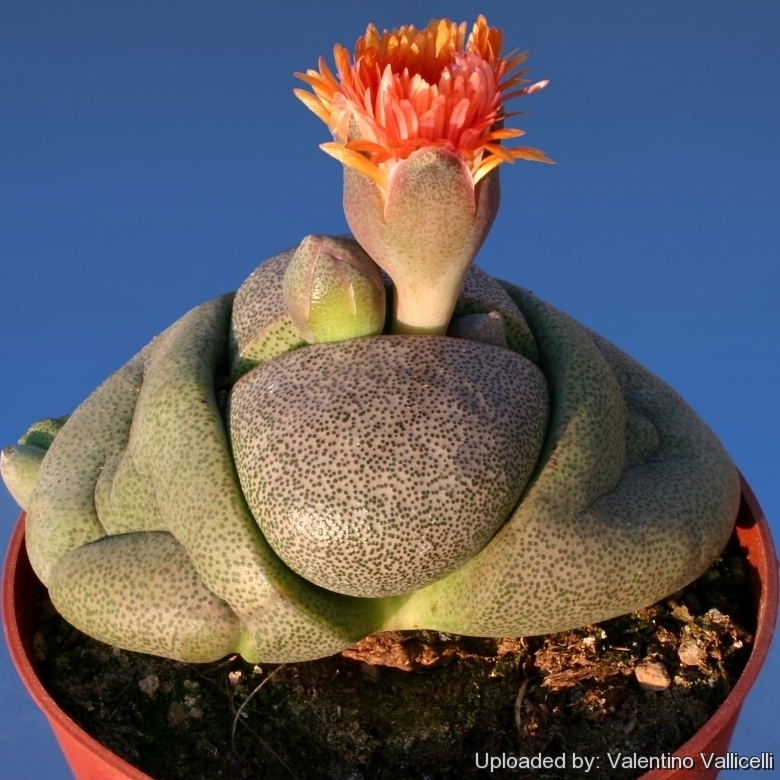 Pleiospilos nelii cv. Royal Flush: The purplish plant body with little dots is topped off with this beautiful bicoloured bloom. 6) Gibbs Russell, G. E., W. G. Welman, E. Reitief, K. L. Immelman, G. Germishuizen, B. J. Pienaar, M. v. Wyk & A. Nicholas. "List of species of southern African plants." Mem. Bot. Surv. S. Africa 2(1–2): 1–152(pt. 1), 1–270(pt. 2).1987. 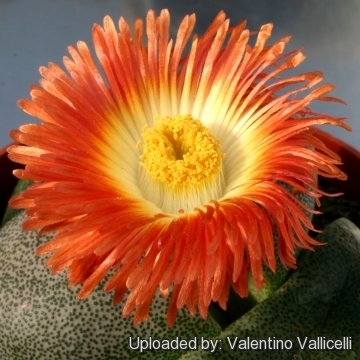 Cultivation and Propagation: Pleiospilos nelii is a very adaptable plant, it will grow whenever it has water and good sunlight, but it will become dormant in very hot weather to conserve water. It need full sun to light shade with a very open compost that drains quickly. The container should be at least 10 cm deep to accommodate the long tap root. Very little water is needed during the growing season, and we do not fertilize the plants. In late summer to early fall before nighttime temperatures fall, watering of the plants is stepped up to once a week. When the nighttime temperatures drop to 9°C, watering is restricted throughout the winter months. In the winter, it grows new leaves from the center of the split, and the new leaves then consume the old leaves. If the plant is over watered, the old leaves remain and the plant usually rots and dies. Not to water it when it is splitting, just leave it alone. Even with no watering the leaves don't shrink and prune up like some succulents do when they are not watered they stays plump even after several months with no water. For an idea of how succulent these plants are, a mature specimen can easily go a whole year without any water in a typical European or North American climate. If the plants are grown correctly, ideally there should only ever be 2 pairs of leaves. The lower ones are the previous years, and the top ones, the current years. One sign of good care is a firm, round, symmetrical plant with no old leaves still attached at the end of summer. The plants are hardy down to -5°C. Propagation: Seeds or by division in early spring before new growth starts. One should not divide clumps too often because they bloom best when crowded.